Two anteroposterior (AP) radiographs of the clavicle (with x-ray beam directed at different angles) are appropriate to assess clavicle mid-shaft fractures acutely and to follow these fractures during healing. The clavicle series includes AP in the frontal or thoracic plane and AP with 20 to 30-degrees cephalic tilt. Technical details of these radiographs are described below. Position – Patient erect with arm at side. X-ray cassette behind patient parallel to thorax. X-Ray Beam – Directed anterior to posterior, perpendicular to cassette and centered on mid-clavicle. 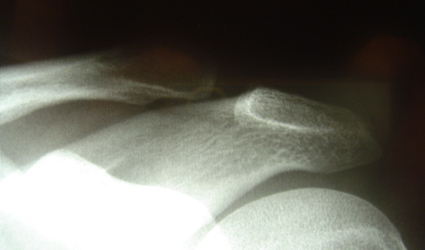 Demonstrates – Clavicle shaft fractures, nonunions. X-Ray Beam – Directed anterior to posterior, angled 20 to 30-degree cephalad and centered on mid-clavicle. Evaluation of the distal third of the clavicle and the acromioclavicular joint (ACJ) is accomplished with two radiographs, an anteroposterior (AP) view in the plane of the thorax and an axillary lateral view (which has already been discussed in the section on glenohumeral joint radiographs). The AP view in particular is commonly used to evaluate fractures of the distal third of the clavicle and ACJ dislocations. Technique for the AP view is described below. Position – Patient is erect with arms relaxed and hanging freely at the side. X-ray cassette is behind the patient parallel to thorax. X-Ray Beam – Directed anterior to posterior, perpendicular to cassette (or angled 10-degrees cephalad) and centered at the coracoid. Voltage of the x-ray beam should be reduced by 50% relative to glenohumeral radiographs to avoid overpenetrating the distal clavicle. Demonstrates – Distal clavicle fractures, ACJ dislocations, ACJ arthrosis. When evaluating patients for suspected ACJ dislocation, comparison view of the uninjured ACJ and distal clavicle should be obtained in all cases. This permits measurement of the coracoclavicular distance on both sides, which defines the severity of the ACJ dislocation and allows recommendation for treatment. 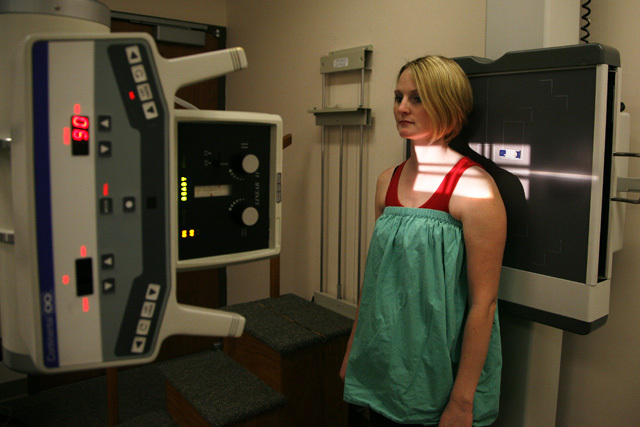 The radiology technician must assure that the AP views of both shoulders are comparable by using identical techniques on both sides. For smaller patients, both shoulders may be exposed simultaneously using a large 14” x 17” x-ray cassette. Evaluation of the medial third of the clavicle and the sternoclavicular joint (SCJ) is best done with a 40-degree cephalic tilt radiograph known as the serendipity view. This view is particularly helpful in distinguishing anterior from posterior SCJ dislocations. Technical details are described below. Position – Patient is supine with large cassette beneath upper thorax, shoulders and neck. X-Ray Beam – Directed anterior to posterior, angled 40-degrees cephalad and centered on the sternum. Voltage should be the same as for standard AP chest radiograph. Demonstrates – Medial clavicle fractures, SCJ dislocations, SCJ arthrosis. Advanced imaging of the clavicle, acromioclavicular joint or sternoclavicular joint may be necessary to confirm the diagnosis suggested by plain radiographs. This is particularly true for the SCJ because the local anatomy does not permit easily interpreted orthogonal views of this joint. CT scan of the clavicle, ACJ or SCJ is usually the best supplemental study when assessing clavicle fracture healing, nonunion anatomy, dislocations or arthrosis at either end of the clavicle.